Before the start of the delivery, many tasks are done by the community team. An important one is to find a cook or caterer, who will prepare a nutritious meal for each of the 14 sessions. 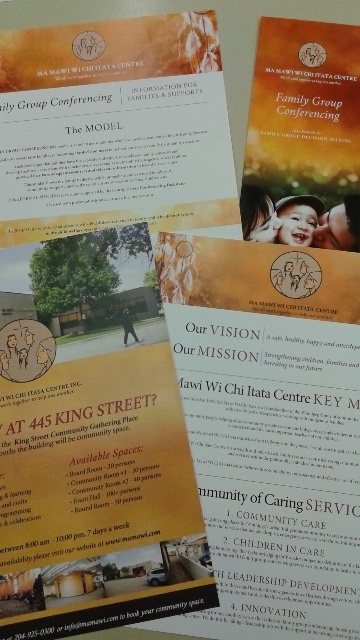 The lead-facilitator, co-facilitator, and Elder will also distribute flyers and organize an information session. A pre-program checklist on page 15 of the Facilitator Manual helps facilitators remembering the tasks to be accomplished. Published by Dominique Geoffroy on January 9, 2018 at 8:44 pm under Uncategorized. 0 comments. 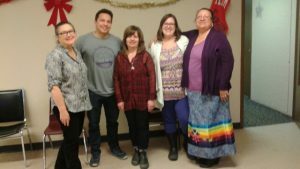 On December 11, Dominique met with workers from the Kenora Chiefs Advisory organization who deliver programs and services to surrounding Anishinabe communities. The idea was to familiarize them with the BII-ZIN-DA-DE-DAH materials such as the videos and games that were created over the years. We played the ‘Fish and Canoe’ game (Session 9: Making Choices), which allows families to think critically on the beneficial or harmful use of a substance after reading a scenario on a playing card. Everyone had fun when trying to get to the top of this ‘snake and latter’ type of game. We also played the ‘Yarn game’ (Session 12: Building Social Support), which consists or saying things that we appreciate from each other, while the yarn is making its way to each participant showing that everyone is connected. Then on December 12, we met with Elders. At each session, their Teachings and stories that relate to the weekly theme are so important for family wellness. 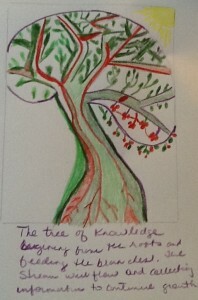 When talking about the ‘Tree of Life’ activity, it generated the idea of creating a new video that would transmit Teachings about different trees. 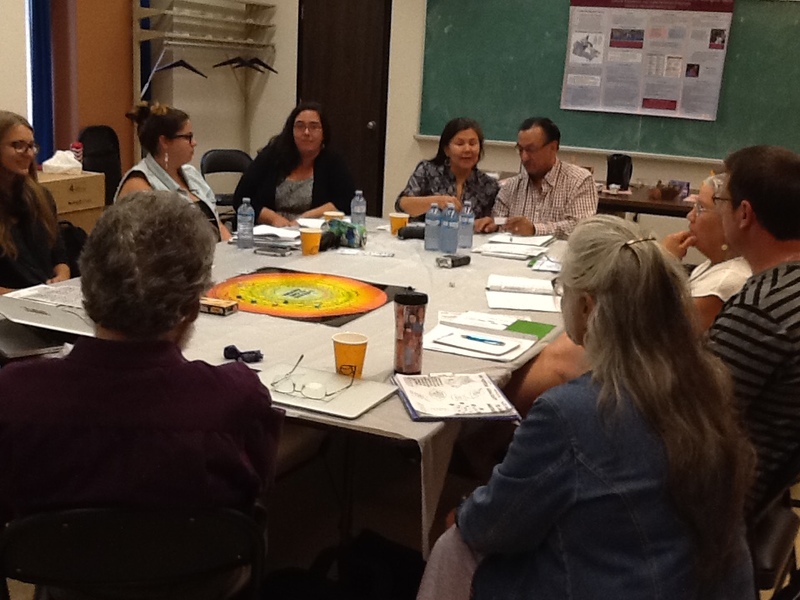 On December 13, we met with managers at KCA to discuss budget and program delivery. On December 14 and 15, Cindy Piche and Dominique trained two new facilitators, Chanda and Kyle from the MA MAWI WI CHI ITATA Centre in Winnipeg and Michelle from the Canadian Mental Health Association of Manitoba. This new group has received their own funding from a private organization and will also be part of the ongoing program evaluation. With them, we reviewed the 14 sessions. At Session 1 (Welcoming Feast), we explained the Turtle game that is played with the ‘Value’ cards on the outer scales. The same board game is used at Session 2 (Family), but this time with the ‘Moon Cycle’ cards on the inner scales. Each time, tobacco cards are distributed to the teams. If needed, players can use a card to ask advice from the Elder. To facilitators: We always appreciate getting feedback after each session. 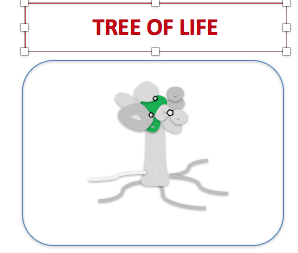 What about the Tree of Life activity? How is it working out in your community or school? To consolidate the skills learned from session to session, each family will create a Tree of Life over the course of the program. Symbolically, the roots, trunk, branches and fruits represent: wisdom from the past, family values, skills, and ideas for the future. At the end of the program, the trees will be displayed on a mural showing the strengths acquired by the families: A forest of strengths. Published by Dominique Geoffroy on December 22, 2017 at 4:03 pm under Uncategorized. 0 comments. For instance, regarding the concept of ‘Scaling-Up’, many participants asked to reconsider its meaning. What about scaling-up the ‘quality of the relationships’ rather than counting numbers of program delivery? This focus on the process might bring other types of significant results. For instance, over the years, many former LTOA facilitators and coordinators have returned to school and/or have moved on to other important professional work, which is also a meaningful way to view the concept of scaling up. The values and practices that build trust, such as when researchers and team partners listen to each other and respectfully work together to address challenges and find solutions. The imperativeness of providing encouragements and being grateful, such as being thankful for everyone’s participation, whether is is at the training sessions, regional Talking Circles or the annual Two-Eyed Seeing Evaluation (TESE) meeting, and for all the tasks that are accomplished at the community level. The research methods that ensure confidentiality and protection for participants to feel safe and supported when sharing their experiences. One of the workshops discussed health consequences from being marginalized as it is sometime experienced by the Indigenous LGBT+ community. We were asked to think on ways to improve this situation within our own project. So we are forwarding this question to those of you who deliver the program. Please tell us your ideas on this issue. One possibility would be to insert in the Facilitator Manual a recommendation to include talks on two-spirited people or sexual orientations, may be within Session 11: ‘Appreciating our Differences and Preventing Discrimination‘. We should also think about the impact of colonization that might have “severely damaged, fragmented, or even lost”* related local teachings (Cameron; 2005). During this 2-day meeting, a moment was dedicated for writing messages to the families of missing or murdered Indigenous girls and women. Many attendees were personally touched by this gesture. 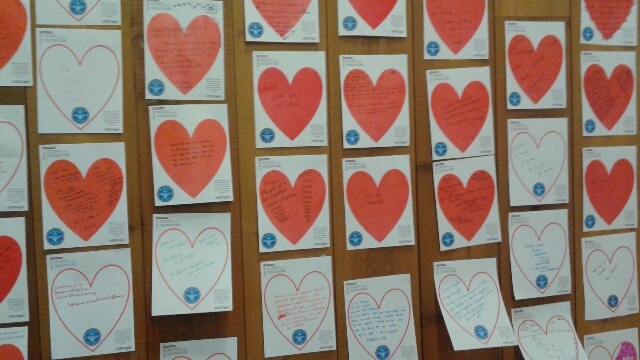 Before sending the wishes, they were first posted on the wall that was covered by hearts filled with love and support. 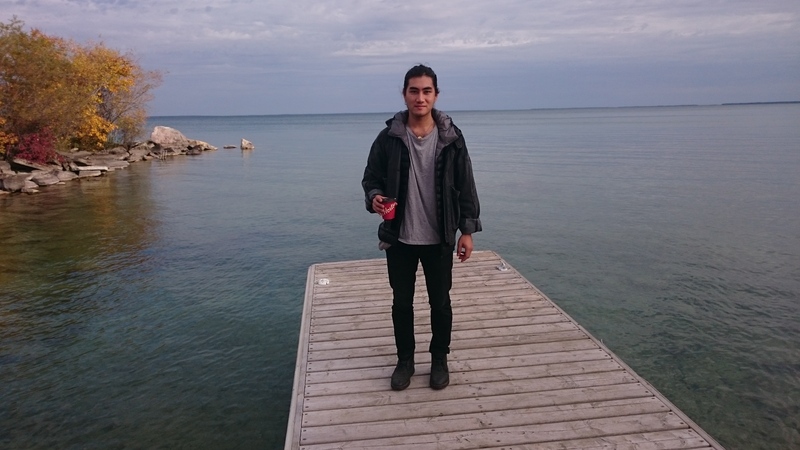 The Pas, Manitoba; September 29-30: Jonathon, the new Swampy Cree coordinator, had invited a mix of new and current facilitators to the Training session. Cornelius Constant, an Elder from Opaskwayak Cree Nation opened the meeting. Rose, Margaret, Grace, Stephanie, Irene, Eli and Dominique reviewed together the Facilitator Manual, the safety plan, and the budget allocated to each community. Margaret, who has delivered the program 3 times in the past, shared her experience and answered questions about how to handle some situations. At lunch time, Rosie from the accounting office came to join us. The day ended by playing both the ‘Turtle’ and the ‘Fish and Canoe’ games. We reviewed the rules that can easily be adapted for younger players. Then, we distributed the 2017-18 materials including a USB key and the program related games to the coordinator and to each facilitator. On September 30, Margaret watched for the first time the video that was filmed in Montreal by the Wapikoni crew that is titled: EPSI – NISTOM – ASKEW – ACHIMOWIN (Long ago, first earth story). 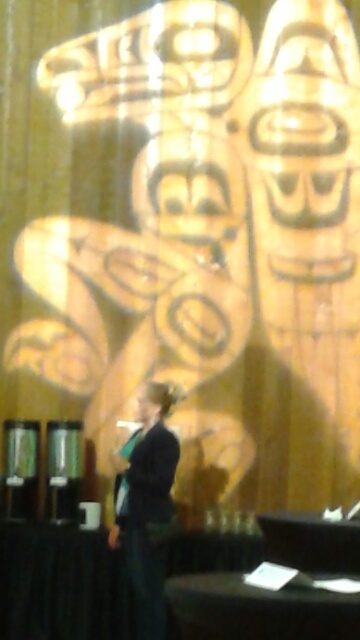 Margaret confirmed that both narrations, Cree and English that are heard almost simultaneously, were correctly edited. The next step is to insert animation on the video, which will be done by a young artist, Raymond Caplan, who will draw various living things, such as animals and plants. Eli and Dominique also had the opportunity to meet Margaret’s grand-mother, a cool 99 years old Cree speaker, who also watched the video. 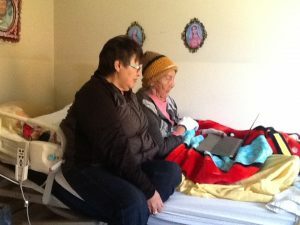 Margaret’s kokum was impressed by her grand-daughter: Margaret is a good storyteller and looks great on camera! Kenora, Ontario; October 2: Nelly, the new Anishinabe coordinator met with Eli and Dominique. We reviewed the coordinating tasks, which are also explained in details in the coordinator binder. Unfortunately, we were recently informed that Nelly will not be able to continue her work with us. The Kenora Chiefs Advisory has now posted the position on its website. Probably in November, when the new coordinator is hired, facilitators will be invited to attend the training session in Kenora. We also had lunch with Cindy Piché, and of course, she misses us (lol!). Later in the afternoon, we met Carolyn Kokokopenace, who has told us that being a facilitator might have helped her obtain a board member position on the Kenora Health Board. Congratulations Carolyn! 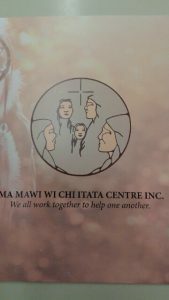 This organization is planning the construction of a new hospital that will include Indigenous perspectives. Winnipeg, Manitoba; October 3: The Canadian Mental Health Association (CMHA) has received funding from the Bell Foundation that will cover, among other services, the cost of the LTOA program delivery, which will be offered at the MA MAWI WI CHI ITATA Centre, an organization that provides many services to the urban Indigenous population in Winnipeg. 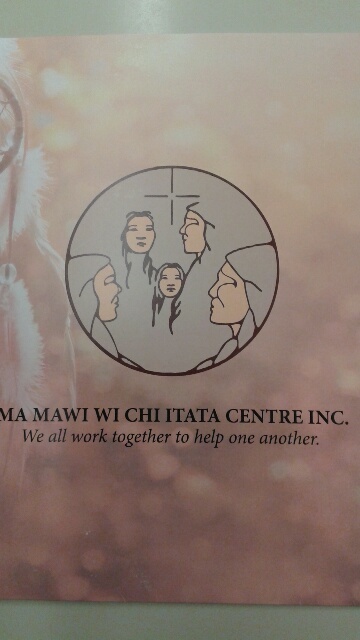 Marion Cooper and her CMHA team, as well as Diana Redsky and two of her colleagues from the MA MAWI WI CHI ITATA centre have met with Eli and I in order to know more about the program’s content and materials. The challenge will be to offer a relevant program to families with various First Nation background. Dr. Laurence Kirmayer, the principle investigator, has already discussed this issue with Indigenous scholars. A 3-day cultural adaptation and training workshop should be scheduled shortly with Elders, knowledge keepers, and facilitators. Funding: For those of you who are actively looking for funds: The next call for Bell funding application will open in January 2018. Published by Dominique Geoffroy on October 17, 2017 at 7:33 pm under Uncategorized. 0 comments. Together, researchers and First Nations partners (Secwepemc, BC; Swampy Cree, MB; and Anishinabe, ON) reviewed feedback received over the last year from participants and facilitators regarding the program’s content and also on some of the challenges that communities sometimes have encountered. Participants from all ages indicated that they enjoy being together. It underscores the importance of providing healthy meals and a safe space for the program delivery. Youth and adults also report their appreciation for the Elder’s story. The lessons embedded in the Teachings are followed by a discussion, which gives the opportunity to talk about daily concerns and to learn from each other (wisdom from within the circle). The local Indigenous worldview is also appreciated as it is mentioned in this following quote: “I learned that I want my children to grow up traditionally and [I will] try [to] learn the language”. We have also received positive feedback from caregivers who report feeling confident about their parenting skills. For example, this quote written after Session 3: “the activities have helped knowing what kinds of skills, values I want my child to grow up with and finding out how they can achieve them”. At the end of Day 1, two young Wapikoni video producers came to our office to film the attendees, who shared their thoughts about the day-discussions. The idea is to communicate the research outcomes to community members and former participants. Once these short videos will be edited, we hope to present them in community gatherings. Figure 1: Amelia, Aaron, Deanna, Eli, Dennis, Nicole, Laurence, Jonathon, Yvonne, Howard, Margaret, Dominique and Madeleine. 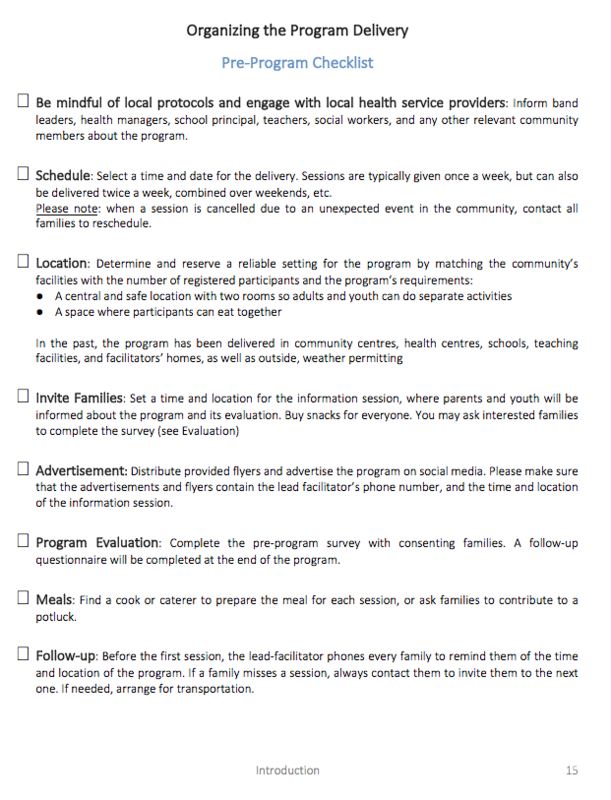 On Day 2, we identified the program components that were the most susceptible to promote family wellness. For example, at Session 12, the strength-based activity that is often mentioned is the ‘Yarn Circle Activity’. It provides an opportunity to say positive things about each other and shows how everyone is connected to each other. A facilitator starts this activity, by throwing a ball of yarn to a participant telling how his/her presence is appreciated. The person who receives the compliment and the ball of yarn continues the process by tossing the ball to someone else in the circle and saying what they appreciate about this person. Everyone says and receives a positive comment, which reinforces strengths as opposed to pointing out negative behaviours. Acorns or fruits to symbolise their visions for the future. At Session 13, a mural with the trees of each family is created to represent a forest of strengths, which will be posted on the wall at graduation (Session 14). Families are invited to explain the meanings embedded in their respective tree to the relatives and guests attending the celebration. This collaborative artwork stimulates participants to discuss their learnings. The creation of an art piece that can be brought home also increases participants’ self-esteem. This outcome was observed by Dr. Jaswant Guzder, pediatrician and researcher who has now moved to Vancouver and is on the process of partnering with an Indigenous group from this region. She presented the ‘Dream a World’ program that was delivered in Jamaican schools over the last 15 years, in which artistic activities have helped many vulnerable youths feel proud of themselves. 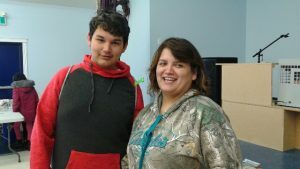 Similarly, Deanna Cook shared about a new program that was offered to the youth at the Splatsin Teaching Society centre over the summer months. In this program too, participants were also proud of creating different traditional items, which they were happy to bring home. Deanna was impressed by the benevolence of former program participants, who were helping out and acting as role model when, for instance, it was time to clean up at the end of the meal. Later on, Nicole D’souza, a young McGill researcher, who is coordinating the CIHR grant with the mandate to evaluate the implementation process, presented some ideas on ways to share our experiential knowledge that we have acquired over the years from participating to the adaption, delivery and evaluation of the program. Key-stakeholders, such as facilitators, coordinators or leaders could be interviewed so that their insight would inform other groups about possible barriers and most importantly, provide a list of solutions that might contribute to the success of a program implementation. Possibly former participants would also be asked about the skills they have learned and how they have used them in their daily life. Each year, we try to integrate more items that reflect the richness of the First Nation cultures. In 2016-17, the Elders were invited to further adapt the program by telling local stories that have been transmitted to them by their Elders. To inspire them, the Facilitator Manual provides examples of stories and videos that relate to the theme of the sessions. For the next version of the Manual in 2018, we hope to receive more stories from each community. It will be the last version of the Manual since funding from the Public Health Agency of Canada is ending in March 2018. 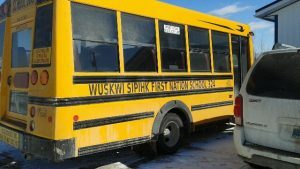 After this date, each regional Indigenous institution will have to find new sources of funding in order to continue offering the program to the surrounding communities. A workshop on funding opportunities and on grant application was given by Madeleine Pawlowski, who has also developed informative booklets on this topic. 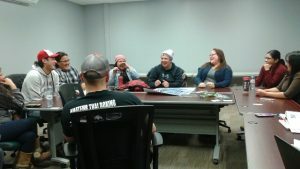 Finally, we watched a new video that was recorded by StrongFront TV (Winnipeg, MB), in which Howard Copenace tells the Anishinabe Creation Story to a group of youth. 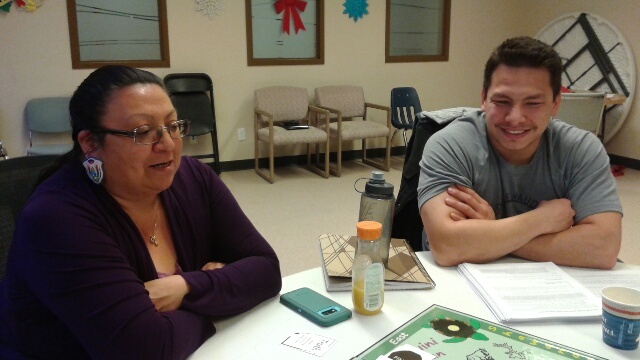 Then, Deanna’s son, Aaron Leon, showed us an ‘Augmented Reality App’ that activates on a piece of paper a traditional Secwepemc story, in which former participants to the program are main actors. AMAZING! It was a nice way to end the day as these accomplishments give us more energy for this year’s program delivery. On September 21, it was Margaret Ballantyne’s turn to be filmed by the Wapikoni crew as she told the Cree Creation Story. 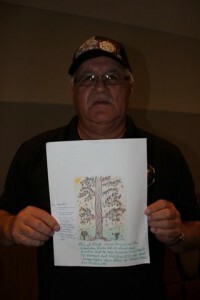 To add visual components to the story, a Mi’gmaq artist, Raymond Caplan, will insert animated drawings to the video. Also, at the sound studio, various First Nation representatives were asked to translate in their languages a video that helps youth understand the impact of anger on others. Hence youth will listen to a video in their native language with English subtitles, which might help them learn new words, while at the same time learning about the impact of anger on others. They will discuss together about things that make them angry and ways that might help a person to calm down. We are looking forward to include these new videos into the respective versions of the program. Figure 3: Jonathon Weenusk, new Swampy Cree Coordinator, is reviewing the Cree translation for the video: “The Child that hammered nails” that helps youths understand the impact of anger. 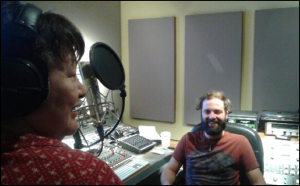 Figure 4: Margaret Ballantyne, a program facilitator, is recording the English tr anslation of EPSI (Long ago) NISTOM (First) ASKEW (Earth) ACHIMOWIN (Story) with Simon Walls (Wapikoni). Published by Dominique Geoffroy on October 10, 2017 at 9:17 pm under Uncategorized. 0 comments. 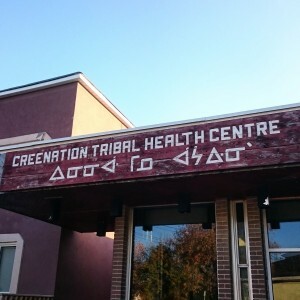 On May 23, Ron Cook, the regional coordinator, organized a sharing circle at the Cree Nation Tribal Health Centre in The Pas. 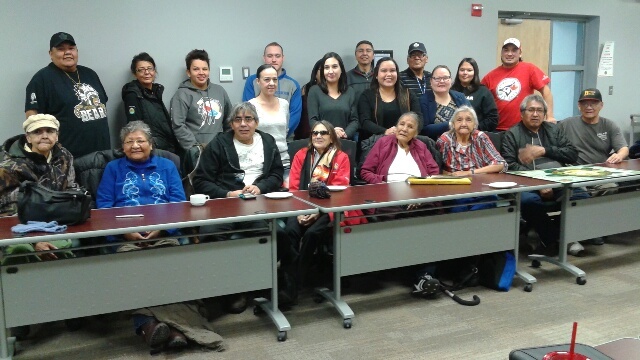 Facilitators, who delivered the program in the Swampy Cree communities in 2016-17, were invited to provide feedback about the new updated Manual and booklets. Sylvia Grey and Patricia Anne Head from Mosakahiken, Jeff Easter from Chemawawin, Delores Hather from Wuskwi Sipihk, Catherine Rickard from Sapotaweyak, and Margaret Ballantyne from Pukatawagan told Eli and I about this year’s delivery. 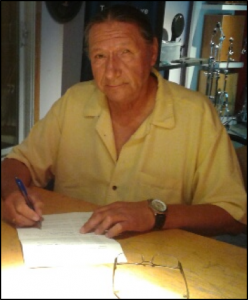 We were also honoured by the presence of Cornelius Constant, an Elder from Opaskwayak. Cornelius is collaborating with our team to translate Cree language video testimonies from Elders’ in the communities we’re partnered with. Future participants will be able to watch these videos throughout the program, and see Elders from their region speak on a range of different themes. Program deliveries will be streamlined if all the material is printed out before the start of the program. Participants, and especially the youth, would appreciate if we reduced the amount of reading in the booklets and the questionnaires. 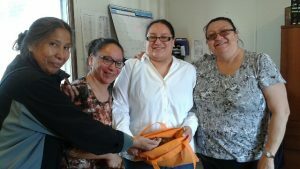 Three items motivate families to attend the sessions: the meal, the transportation (often provided by facilitators themselves), and the graduation gifts, which also act as promotional material for the program, as word of mouth spreads in the community. The Elder’s teachings and stories captivate youth and adults, and participants are especially receptive when the Elder offers Cree teachings. 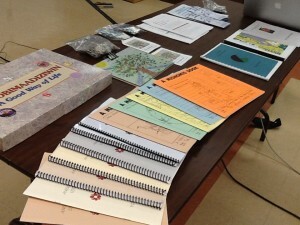 The booklets play a key role in stimulating discussion. It may take some time before participants feel comfortable sharing their thoughts. Participants really enjoy the Yarn Circle activity. Facilitators report that parents and youth appreciate the opportunity to reflect on one another’s good qualities. The web of thread helps ilustrate how participants are interconnected and impacted by one another. The cultural components are important since the youth in some communities don’t have many opportunities to learn their language or other links to the Cree culture. The sessions provide a space where people can rally around one another to support one another. Facilitators see the program as a platform that allows them to share their vision for their communities. On behalf of all our teams across Canada, we also would like to congratulate and wish a lot of happiness to Rosie Agecoutay who is getting married this summer. Similarly to Kim in Kenora, Anne in Splatsin, and Michel in Montreal, Rosie is the CNTHC financial person who balances budget and expenses. She has also shared this kit below. Thank you to all of you for your meaningful work. A PENNY so you will never say, “I’m broke“. An ERASER so you can make all your mistakes disappear. A MARBLE in case someone says, “you’ve lost your marbles“. A RUBBER BAND to stretch yourself beyond your limits. A STRING to tie things together when everything falls apart. A HUG and KISS to remind you that someone, somewhere cares about YOU! 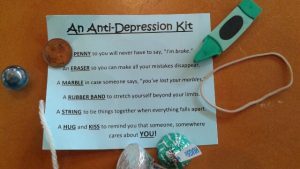 Published by Dominique Geoffroy on May 30, 2017 at 8:47 pm under Uncategorized. 0 comments. Carla, Clara, Carolyn and Cindy in Grassy Narrows ON. We are in the process of making training videos so that the program’s facilitators will be able to watch a description of each session before delivering it. We will continue the filming during the upcoming regional Sharing Circles and training sessions. Delores and her son in Wuskwi Sipihk Cree Nation MB. 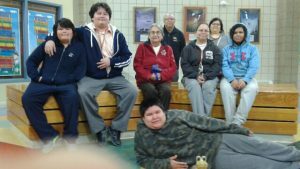 The pictures are showing some of the participants and facilitators who we met in the Anishinabe and Swampy Cree regions. Another dream: What about a ‘Listening To One Another’ bus? 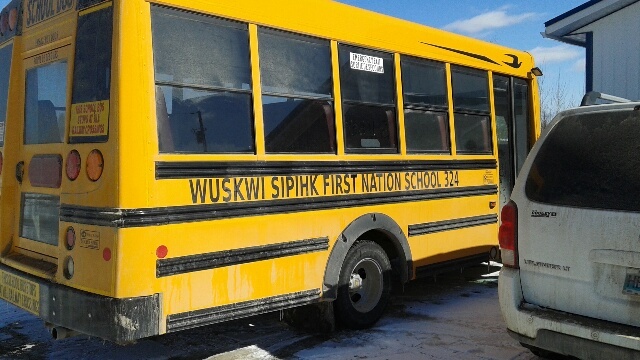 Could we borrow the local school bus to transport participants to the weekly sessions in each community? All Aboard! Parents, Elders, youth, siblings and facilitators. Or may be a Caribou ride? Can you please bring us to our Listening to One Another session? Published by Dominique Geoffroy on April 25, 2017 at 6:18 pm under Uncategorized. 0 comments. 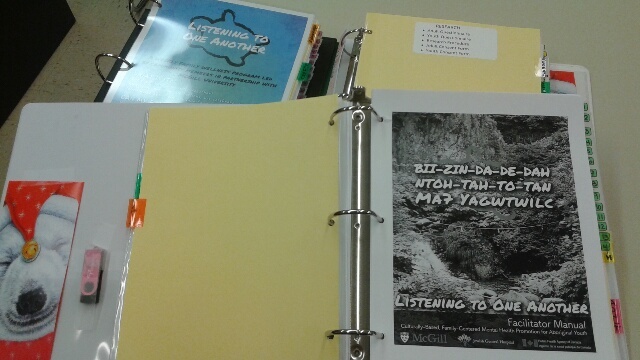 This post is co-authored by Amanda Chalupa and Eli Oda Sheiner, team members at the Montreal site of the Listening to One Another program. 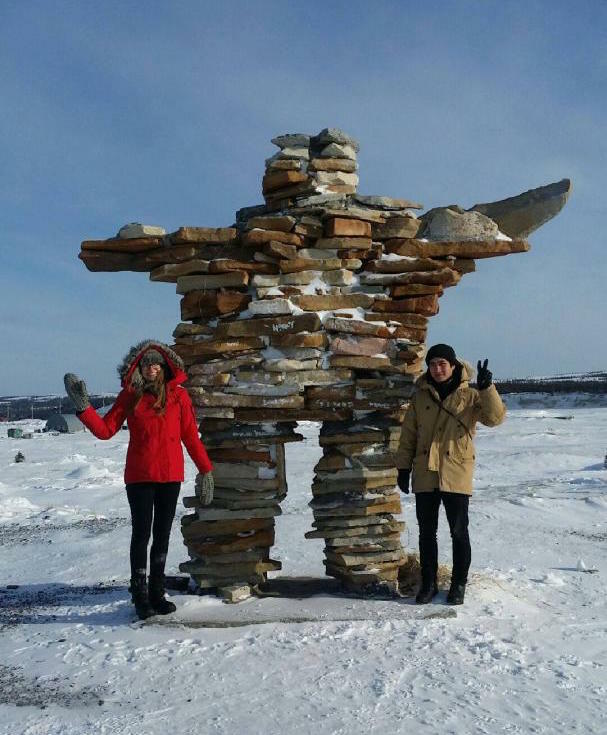 This March we had the opportunity to visit Kuujjuarapik, a vibrant Inuit community located in Nunavik, on the coast of Hudson’s Bay. 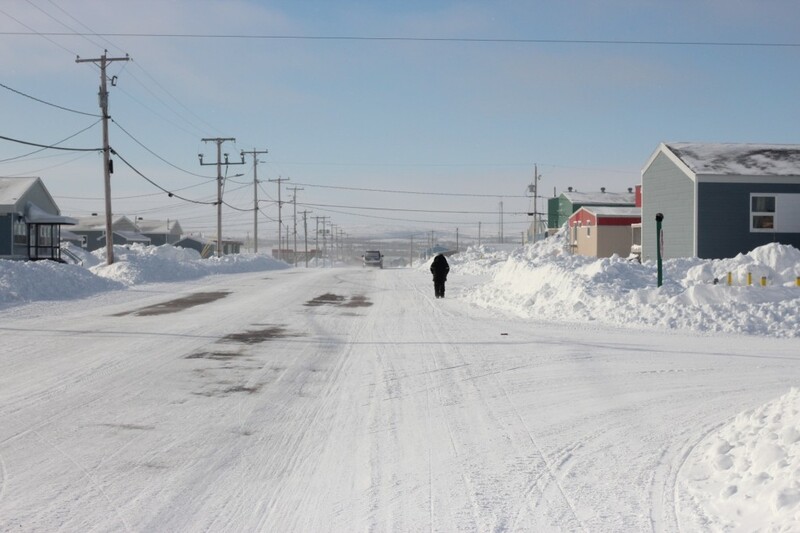 Working in partnership with the Tasiurvik Family House, we travelled to the community to explore the possibility of adapting the Listening to One Another program with the local Inuit community. 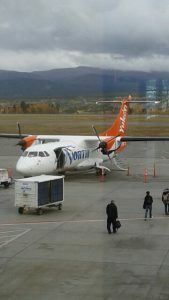 We arrived by propeller plane on a Wednesday afternoon and were immediately struck by Kuujjuarapik’s sunshine and crisp winter air. 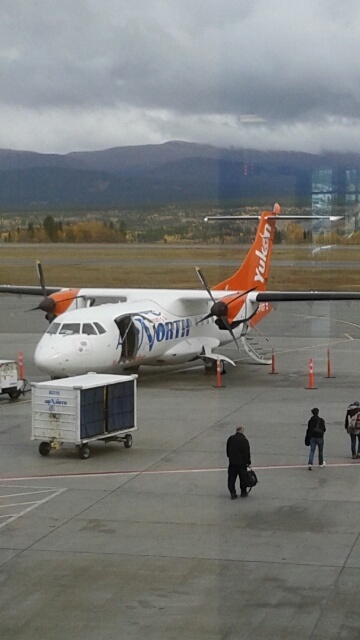 We were greeted at the airport by Sarah Fraser, a researcher partnered with the Tasiurvik Family House. Making our way through the snowy town, we were greeted by friendly faces and kind words. Along the way to the Tasiurvik Family House, we met Caroline, an Elder and core member of Tasiurvik, and her nephew. 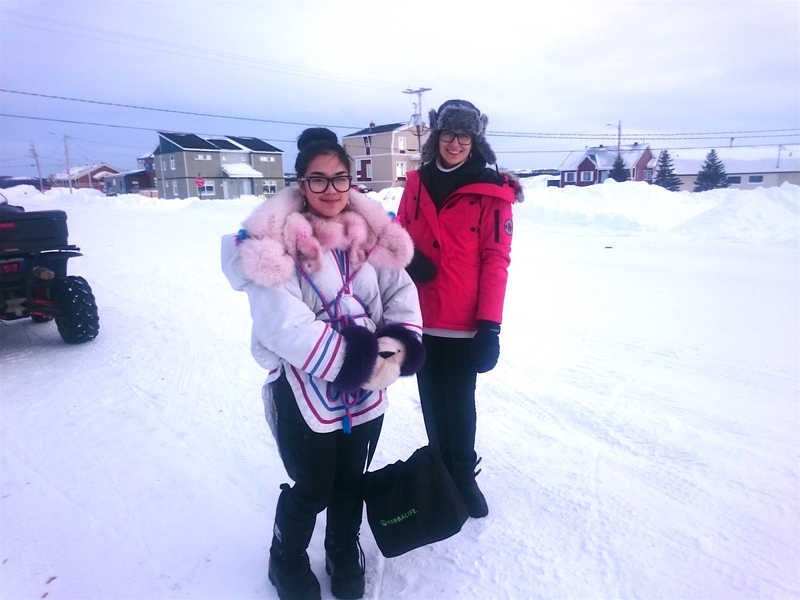 At our destination, we received a warm welcome from Maria, the Tasiurvik coordinator, and Jeannie, a community member currently attending college in Montreal. Later that day, we were given a tour of the town by Jennifer, another core member of Tasiurvik. She showed us local highlights, from docks on Hudson’s Bay and the community arena, to the community fridge and the giant inuksuk. Over the course of the next days, Maria, Jeannie, and another new friend, Vanessa, of Youth Protection Services, taught us about their community and connected us with Elders and locals who could help us adapt our program materials. One of the first lessons that we learned in Kuujjuarapik is that food brings people together. So, it should come as no surprise that many of the meetings that followed took place over a meal. Speaking with Elders who came to eat and talk with us at Tasiurvik, as well as a home-visit, we learned about how the most senior members of the community lived as children, and how the town has transformed over the course of their lives. One of the Elders, Willie, invited us into his home to tell us the story of Kuujjuarapik. We sat cross-legged on the floor watching attentively as he looked into the distance as though looking back in time. We were also privileged to see his childhood toys: various bones preserved from his youth that represent different characters. Throughout our stay, community members shared incredible insight about local strengths and challenges, helping us understand the context that contributes to some of the struggles that youth deal with on a day-to-day basis and how to go strong together. Elders also offered wisdom to help youth and families get back on their feet and stressed the importance of values such as forgiveness. Our stay concluded with a brunch at Tasiurvik. Young and old alike enjoyed a meal and fun times together, including painting, drawing, games, playing music, embroidery, and the joys of simply being together! Jeannie and Ray, members of the core team, joined in to share their valuable insight. We look forward to continuing the conversation, perhaps next time in Montreal! Meeting with local role models of all ages, we got a sense of Kuujjuarapik’s strengths. With continued teamwork and a shared vision, we’re hoping that Listening to One Another can be a platform for some of these role models to share their talents with the local youth. We met community members who travelled huge distances on foot to raise awareness for different issues, learned about athletes who represent Kuujjuarapik at the Northern Games, and heard stories about talented hunters. We got to know, among the people we met at Tasiurvik, throat singers and gifted clothing-makers, embroiderers and beaders. We met soapstone carvers, skilled cooks, and community champions. The diversity of talent in Kuujjuarapik was truly impressive! Since our return, we have kept in touch with our new friends in Kuujjuarapik and at the Tasiurvik Family House. In the months to come, we hope to continue our collaboration with community members and co-create a program that reflects and responds to the community’s goals. 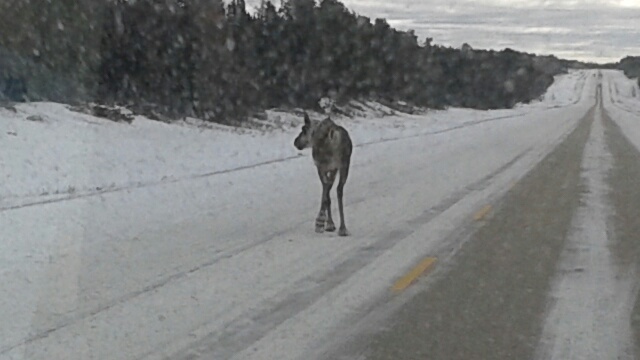 We are grateful for the kindness and hospitality shared by the Kuujjuarapik and Tasiurvik community. Published by elisheiner on March 21, 2016 at 4:15 pm under Uncategorized. 1 comment. I’m happy to be featured here as a guest author on a blog post. After a summer devoted to improving components of the Listening to One Another program, I had the opportunity to travel to The Pas, in northern Manitoba, and Kenora, in northwestern Ontario. Together with our very talented coordinators Ron (at the Cree Nation Tribal Health Centre) and Sheila (at the Kenora Chiefs Advisory), we discussed new additions to the program with our local facilitators and organized the technical, behind-the-scenes elements that allow the program to run smoothly for local youth and their families. In The Pas, I spent a few quality days working side-by-side with Ron, who taught me all about the local scene as we shuttled between the various Cree Nation Tribal Health Centre offices and local businesses, compiling supplies for the three Swampy Cree First Nations delivering the Listening to One Another program in the region. On Thursday, October 1st, Ron and I hosted the facilitators from all the partnered communities in the region and brought them up to speed on some of the exciting changes we’ve made to our programming. 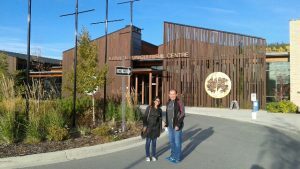 The next week, after a brief stay in Winnipeg, I was in beautiful Kenora, with Sheila, our regional Anishinabe coordinator. The two of us conducted our meetings while Sheila tended to her ceremonial responsibilities at the Grand Council Treaty #3 Fall Assembly, taking place in Whitefish Bay. The Fall Assembly provided the perfect chance for Sheila and I to meet informally with many of the Chiefs and Health Directors from the six Anishinabe First Nations that are delivering the Listening to One Another program this fall. New acquaintances were “all ears” to learn about our program, and excited about the prospect of introducing it to their communities. 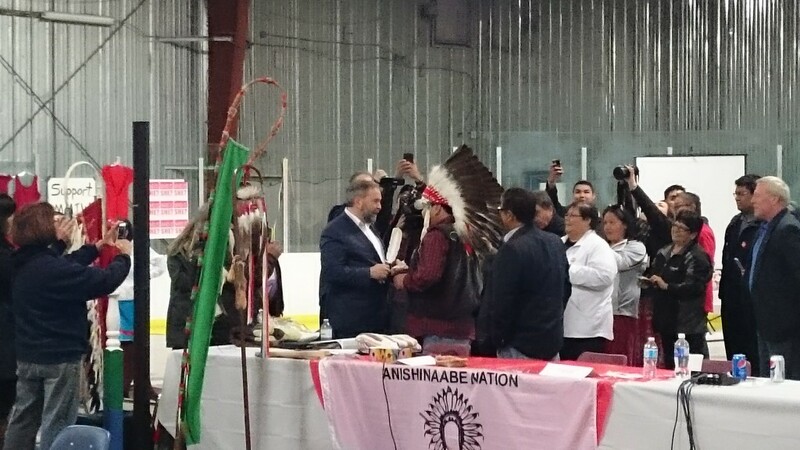 Warren White, the Grand Chief of the Anishinabe Nation in Treaty #3, exchanges a feather with NDP leader Tom Mulcair at the Fall Assembly. After a productive couple of days at the Fall Assembly in Whitefish Bay, Sheila and I welcomed some of our facilitators to the new Kenora Chiefs Advisory facilities and discussed improvements to our program. We received a lot of positive feedback from the facilitators, which we are eager to integrate into future material for the Listening to One Another program. In the coming month, we look forward to the inauguration of another year of the Listening to One Another program. I’m really fortunate to be working with so many enthusiastic people and communities. Published by elisheiner on October 13, 2015 at 8:51 pm under Uncategorized. 3 comments. At the end of August, knowledge keepers, health centre managers and researchers reviewed the evaluation and the content of the 2015-16 Facilitation Manual. Published by Dominique Geoffroy on September 4, 2015 at 7:01 pm under Uncategorized. 0 comments. June 2015. 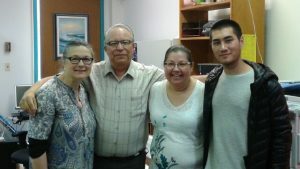 The Family program ‘Listening to One Another’ was presented to school and local health centre representatives by Dr. Laurence Katz who has been working with the Swampy Cree Team for many years. Some of the program’s facilitators were also part of the audience. Attendees participated to a group discussion on ideas for reaching sustainability. 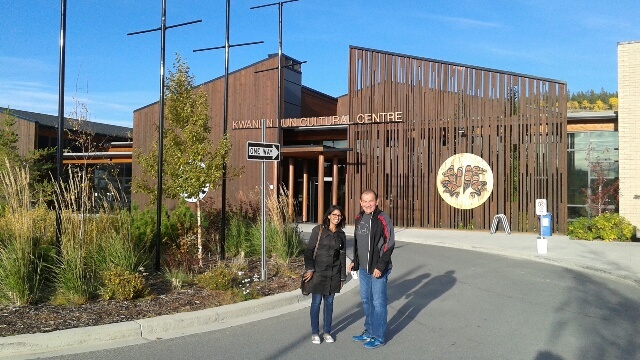 In addition Dominique Geoffroy, the project coordinator, discussed with Mr. Garry Munro, Director of the Cree Nation Tribal Health Centre in The Pas, Northern Manitoba. He indicated that the OCAP principles should be included into the research agreement that is to be signed by partners this summer. The OCAP principles ensure data Ownership, Control, Access, and Possession to First Nation partners. The new Phase 3 Team Report Template, which contains guidelines and checkboxes for recording progress. 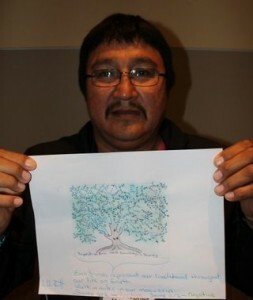 A cultural adaptation of the program is continuously in progress: to create a new puzzle that will be given to youth participants during the next Swampy Cree program, volunteers draw their version of the Culture Tree. A committee had the difficult task of selecting only one of the drawings. 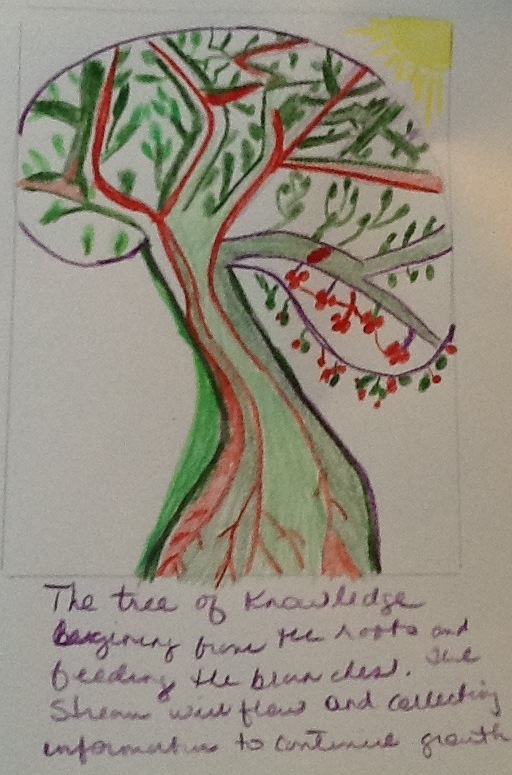 Another example of the drawings: The “Tree of Knowledge”, a brain-shaped tree that was created by Gloria. Published by Dominique Geoffroy on June 8, 2015 at 4:58 pm under Uncategorized. 0 comments.